August 30, 2011 - Federal Aviation Administration (FAA) Administrator Randy Babbitt announced that the FAA has approved production of the Boeing 787 Dreamliner. At an event at Boeing’s facility in Everett, Washington, Administrator Babbitt presented Boeing executives with two certificates for the design and production of the Boeing 787 Dreamliner with Rolls-Royce engines. The first, a Type Certificate, is for the FAA’s approval of the airplane’s design. The second, a Production Certificate, allows Boeing to manufacture the 787 following a rigorous review by FAA inspectors of Boeing’s quality system, production tooling, manufacturing processes and controls, inspection methods, and supplier control procedures. The European Safety Agency (EASA) also issued validation of the FAA Type Certificate of the 787. Boeing made its initial application to the FAA on March 28, 2003 and the program was launched in April 2004. The first 787 rollout ceremony was on July 8, 2007 at Boeing’s Everett assembly factory. The airplane first flew on Dec. 15, 2009, and the six flight test airplanes have since accumulated more than 4,645 flight hours, with approximately 25 percent of those hours flown by FAA flight test crews. More than 200,000 hours were logged by FAA technical experts who were involved in the type certification of the 787. The Boeing 787 Dreamliner is a long-range, mid-size wide-body, twin-engine jet airliner developed by Boeing Commercial Airplanes. It seats 210 to 290 passengers, depending on the variant. Boeing states that it is the company's most fuel-efficient airliner and the world's first major airliner to use composite materials for most of its construction. The 787 consumes 20% less fuel than the similarly-sized Boeing 767. Some of its distinguishing features include a four-panel windshield, noise-reducing chevrons on its engine nacelles, and a smoother nose contour. The aircraft's initial designation was 7E7, prior to its renaming in January 2005. The first 787 was unveiled in a roll-out ceremony on July 8, 2007, at Boeing's Everett assembly factory, by which time it had become the fastest-selling wide-body airliner in history with 677 orders. 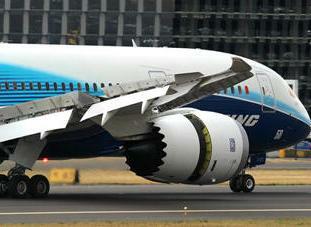 By June 2011, 827 Boeing 787s had been ordered by 59 customers, with ILFC having the largest number on order. The 787 development and production has involved a large-scale collaboration with numerous suppliers around the globe. It is being assembled at the Boeing Everett Factory in Everett, Washington. Aircraft will also be assembled at a new factory in North Charleston, South Carolina. Both sites will deliver 787s to airline customers. Originally planned to enter service in May 2008, the project has suffered from repeated delays and is now more than three years behind schedule. The airliner's maiden flight took place on December 15, 2009, and completed flight testing in mid-2011. Final Federal Aviation Administration and European Aviation Safety Agency certification was received on August 26, 2011, at a ceremony in Everett, Washington. While Boeing had been working to trim excess weight since assembly of the first airframe began, common for new aircraft in development, the company stated in December 2006 that the first six 787s were overweight, with the first aircraft expected to be 5,000 lb (2,270 kg) heavier than specified. According to International Lease Finance Corporation's (ILFC) Steven Udvar-Hazy, the 787-9's operating empty weight was around 14,000 lb (6,350 kg) overweight. The seventh and subsequent aircraft would be the first optimized 787-8s and were expected to meet all goals, with Boeing working on weight reductions. As part of this process, Boeing redesigned some parts and made more use of lighter titanium. Remarks by J. Randolph August 26, 2011 – “Thank you, Jim (Albaugh) for that kind introduction. It’s great to be here on this momentous occasion. And it truly is momentous – not just for Boeing and the FAA, but also for the economy, and for the global aviation system. “I want to begin by saying how very proud I am of the FAA team’s role in making this day possible. Since the 787 first flew in December 2009, the six flight test aircraft have accumulated 4,645 hours. FAA flight test crews flew 25% of those hours. “The FAA also logged 200,000 hours of technical work in the 787 type certification project. And our Transport Airplane Directorate developed 15 special conditions – essentially new design regulations to address innovations that existing rules don’t fully cover. “I want to thank the FAA team for your hard work and dedication to this project. This is another example of the professionalism of our fine work force. The Boeing 787 Dreamliner is an incredible technological achievement—one that sets a new standard for innovation on many levels. “The 787 is the world’s first major airliner to make such extensive use of composite materials – over 50% by weight. This technology results in an airplane that will fly as fast as today’s speediest wide body aircraft, while using 20 percent less fuel than airplanes of similar size. The use of composite materials, engine technology advancements, and changes in systems architecture will also reduce noise. “Improved situational awareness with the electronic flight bag and dual Heads Up Display (HUD), communication capability that will support greater use of digital communication versus voice and advanced navigation capabilities that are fully integrated with the flight management system. “At the outset of this program, the FAA and Boeing developed a new way of working together. Rather than wait for issues to arise, we started out by working collaboratively—and proactively—to identify certification issues expected to arise from some of the 787’s novel design features. With this high level of technological innovation, it was not possible to anticipate everything. But, we had a plan for working issues to a resolution that would ensure the result we always want: a safe and compliant aircraft. “And that brings me to the reason we are here today. It is my privilege and pleasure first to present the FAA type certificate. And now I am delighted to present the FAA production certificate for the Boeing 787 Dreamliner. “Congratulations to Boeing, to the FAA team, and to every person and organization here today who had a role in the creation of this magnificent machine. I thank you for the opportunity to be part of this important day for aviation.